This past week was our first week of homeschooling! We had SO much fun, I feel like it was stress free and Tonchi and I (and sometimes Koa and Aisling joined in) really just had a good time together. I can say that after the first week, but I hope I can say that after the 4th week and the 44th week and the 4th year and so on! This is a new start for us and I’m super excited! So what does that have to do with peking duck? Well… Our main curriculum, if you wanna call it that, is called Five in a Row. The idea is that we read a classic children’s book five days in a row and each day we learn about something new. This week we did the book “The Story of Ping”. Some of the things we learned included a little culture about China, a little science about ducks, a little math by counting all the ducks in the book (there were 95! ), and art which we looked at the different perspectives in which the duck Ping was drawn! So in keeping with the topic I decided we would have peking duck this week which is a chinese dish! I thought it would be fun to enjoy a cultural dish as well as duck since we learned about ducks. After purchasing it (which was very expensive even for an Asian market – I think $18 for a 4 lb duck!) I started to second guess myself. I wondered what the boys would say or think after reading a book that personalizes Ping and then say we were going to eat him for dinner! Oh dear! I didn’t have to worry! They thought it was great in the book that Ping escaped becoming dinner for the family that caught him, but they didn’t mind in the least when we ate him tonight for dinner! In fact, I made a comment that we were eating duck, but not to worry it probably wasn’t Ping. Koa piped up that Ping escaped the Chinese family, but we caught him and had him for dinner. I guess they learned a little about the circle of life and they seemed totally ok with it! YAY! Also, in the course of talking about ducks all week both Tonchi and Koa think that when we move and have a yard we need to have ducks so that we can have eggs to eat and ducks to eat. They do want fluffy ducklings as well! Tonchi said he would be happy to feed them! So… on to the recipe. I tried to prepare it as it is traditionally as possible, but definitely didn’t serve it as it is usually served. Usually the duck meat is wrapped in Asian crepes with green onions and hoisin sauce placed on top. Since we aren’t doing grains (but we had rice… white at that!) I decided not to do the wraps. After the fact, Brian, suggested we could have used the coconut wraps instead. Oh well… that will be an idea for another time! 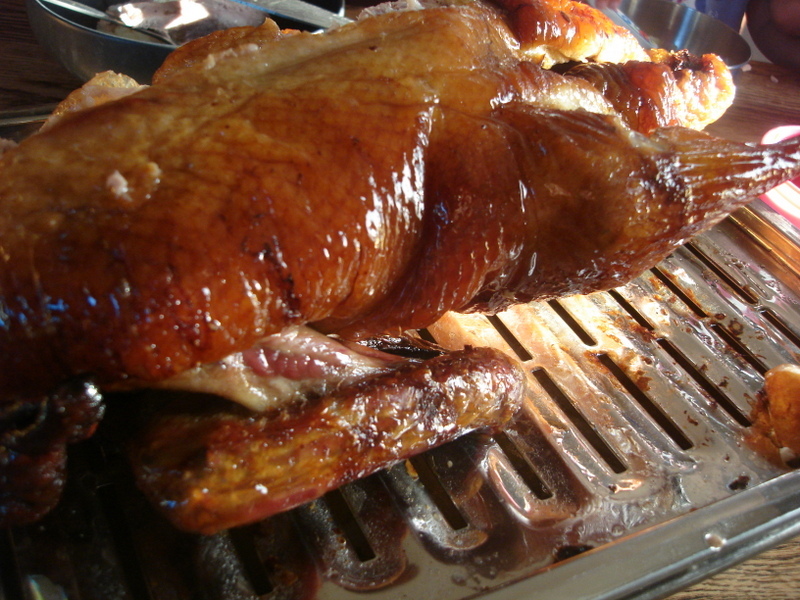 Below is the recipe for the peking duck. It took all day to prepare, but it wasn’t labor intensive at all. We were still able to do school, go to the library, do a little cleaning and other activities of the day. 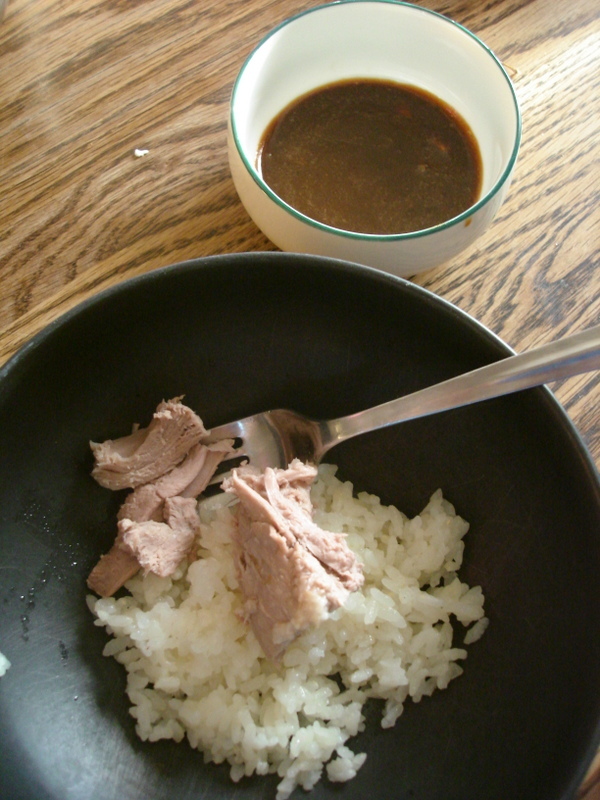 I also included the recipe for hoisin sauce as well. I used to buy it and actually still have some in the fridge, but it has soy sauce and wheat in it, so Tonchi and Aisling wouldn’t be able to have it. The sauce turned out great and the whole meal was a hit! Rinse duck well. Wipe dry and tie string around neck. 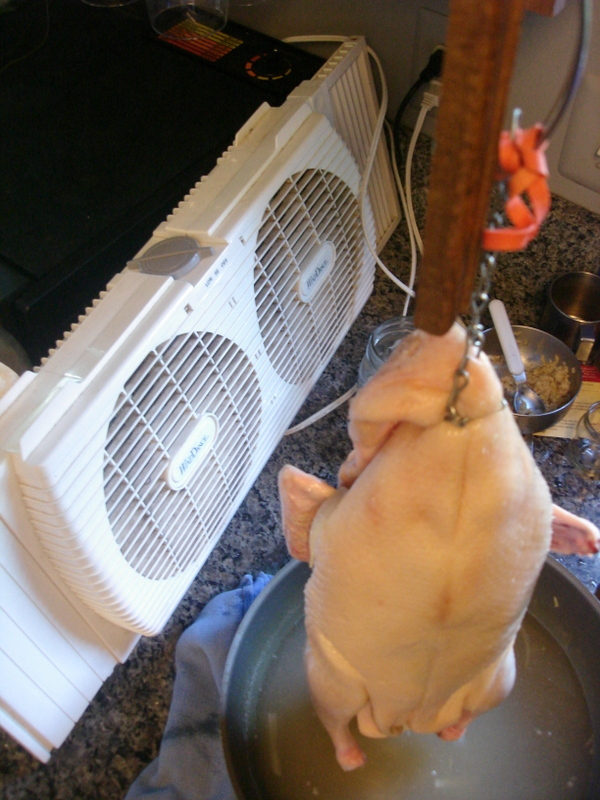 Hang duck in cool, windy place 4 hours. I put a fan blowing on it. Keeps the flys and bugs off. Fill large wok with water. Add ginger, scallion, honey, vinegar, and sherry. Bring to boil. Pour in dissolved cornstarch. Stir constantly. Place wok under duck and scoop boiling mixture over duck for about 10 minutes. Hang duck again in cool, windy place for 6 hours until thoroughly dry. Fill bottom of roasting pan with 2 inches of mixture from above. Turn duck and roast 30 minutes more. Turn breast side up again. Roast 10 minutes more. Use sharp knife to cut off crispy skin. Serve meat and skin immediately on a prewarmed dish. The duck is eaten hot with hoisin sauce Garnish with scallion flowerets. Notes: Duck is VERY oily, but I didn’t mind at all! I separated the oil from the drippings and saved all the duck fat and skin and rendered it. The cracklings we had for “bacon” the next morning and now I have duck fat to cook with! I ended up with a pint of fat from one 4 lb duck! Mix all ingredients together. I mixed them in a mason jar and shook well. It worked well, was easy to store after dinner and it does separate, so it’s easy to mix again. I may do it in a salad dressing jar the next time so it is easier to pour. I served it in small dishes at each plate for dipping the duck pieces in. Brian said he needed to add this to his top 5 favorite meal list. I said it would only be served at birthdays or Christmas since the duck was so expensive! Now we have a “treat” meal that we all love and will look forward to! Have you had duck before? What did you think? Would you make it again? Previous So What’s Wrong with Sugar?